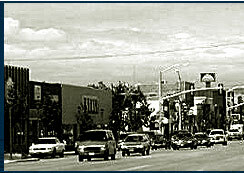 In July of 2002, the City of Worland completed a project assessment and plan for the North Worland Project, a community-based transportation, economic development, and recreational opportunities initiative. The plan outlines recommendations for the construction of an industrial park, a pathway around the park, and changes in railroad crossings and truck routes. The purpose of the North Worland Project is to boost economic opportunity, increase transportation safety, and enhance recreational opportunity. CommunityVizTM is being used to facilitate development of the North Worland Project by evaluating potential environmental, economic, and recreational impacts of site level development alternatives. 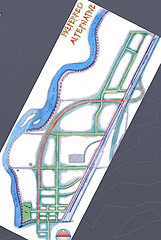 The project is currently developing a very high resolution digital elevation model for evaluating options for flood plain mitigation in the project area. 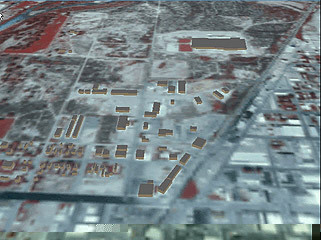 The preferred alternative of the North Worland Project Plan (left) and an initial 3D rendering of the CV project study area (right).